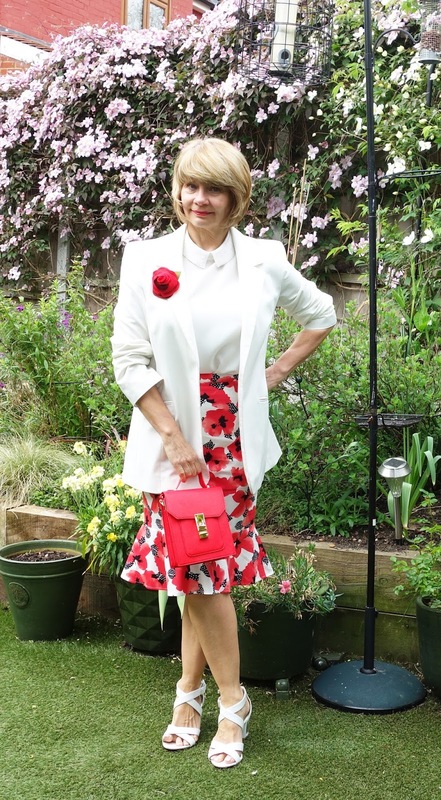 I loved the poppy skirt as soon as I saw it - I like the fluting edge of the skirt. 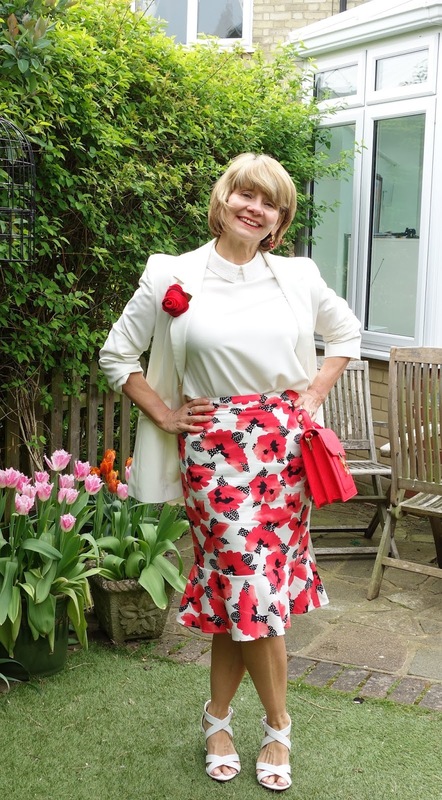 The skirt is by Precis Petite, but although at 5'5 (165cms) I'm not petite, I find their clothes usually fit me fine so it doesn't put me off. 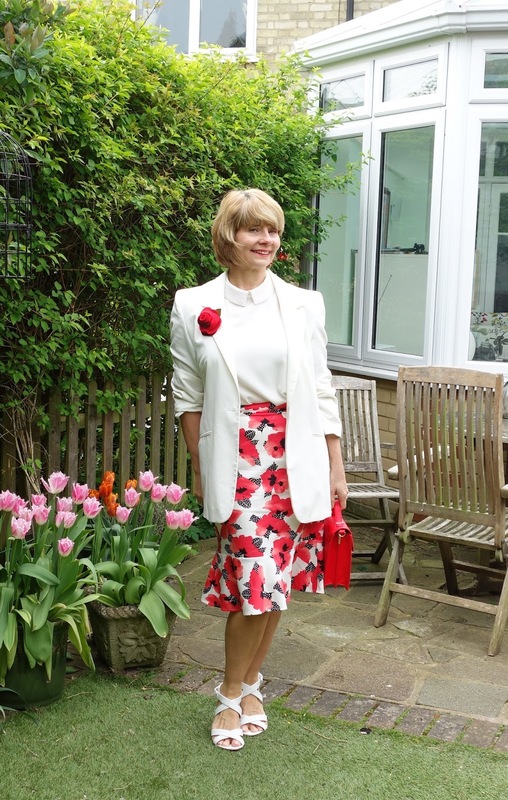 The white sandals, with mid-height perspex heels, have been a big hit with me because they're very comfortable. I've had the jacket for two years and the top is also an oldie, but they're both incredibly useful. Firstly they're not a bright white. Bright white suits very few people: I try to look for ivory or soft white (which Kettlewell sell). The top has a cute Peter Pan collar in pearls. I'd like to find a red top that matches the poppies, so I'm on the look out. I don't often wear earrings because you can't see them under my hair. I adore anything to do with cherries though and I picked these up at a Christmas bazaar. I'm having a radical new hairstyle soon so maybe I will be able to show off a few more earrings! Jacket, Asos, past season. Skirt, Precis, past season. Sandals, past season, Marks and Spencer. Pearl collar top, Ted Baker, past season. I didn't have any joy in finding an alternative. Red bag: Sainsbury's; red felt flower, Crafty Jo Designs at Etsy. Is there a particular color or combination that makes you happy for summer? Monday (1st May): NEW - the Five @ 50 challenge - "something old, something new, something borrowed, something blue." Such a great look Gail. Lovely and fresh & I like the flare on the skirt. I love this outfit Gail!! 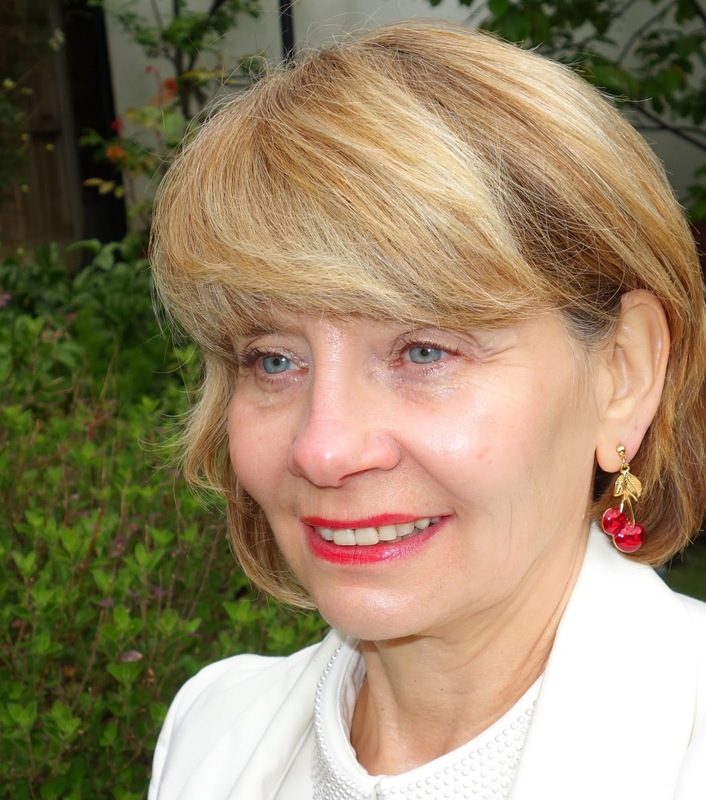 I know what you mean about earrings---in fact, I just painted a pair so they would show up better against my hair. I can't wait to see your new "do"! SO stunning! Love this springy combination. Such a cheery skirt! You look great. So smart, Gail, and I especially love the skirt and shoes. Great look. Thanks for linking up to Top of the World Style. I love this skirt! So chic! I can see why you went for this skirt! I love it! I have a dress with larger poppies and it just is such a pretty print. Love the flutter hem and I love the strappy sandals! Goodness, this is such an eye-catching look! 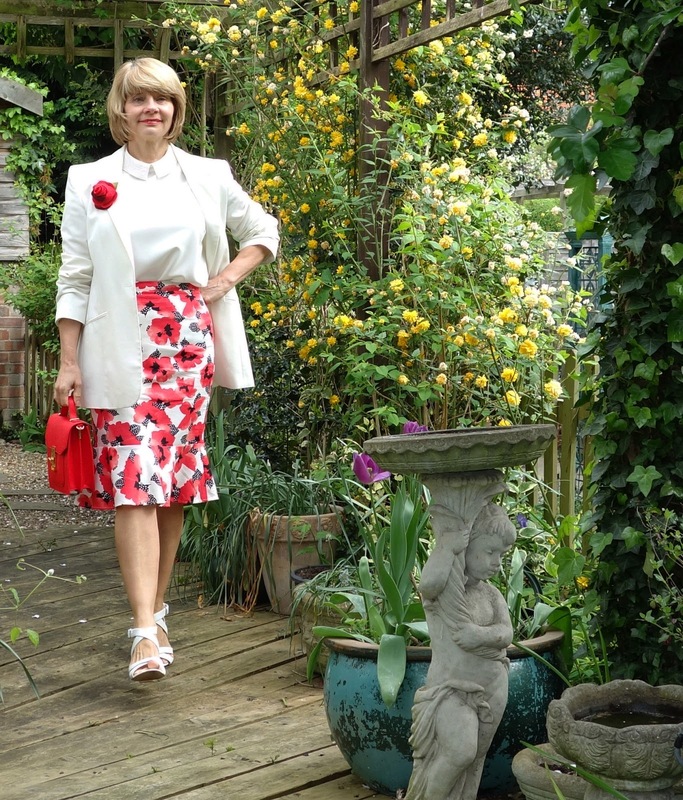 The poppy skirt is beautiful and I really like it styled with your longer blazer. The addition of the floral brooch was brilliant. Thanks for linking up with Fabulous Friday, Gail!